Whewww, we survived another wild edition CKUT’s annual funding drive – THANK YOU to all who helped support us. It was a whirlwind 10 days of live remote broadcasts, special events, and crazy no-holds-barred radio magic. Apologies for the lack of charts last week, but we were too busy runnin around answering phones and hauling gear around Montreal by bicycle to crunch any chart numbers. We are very close to our $60,000 goal and the pledges keep on rolling in. 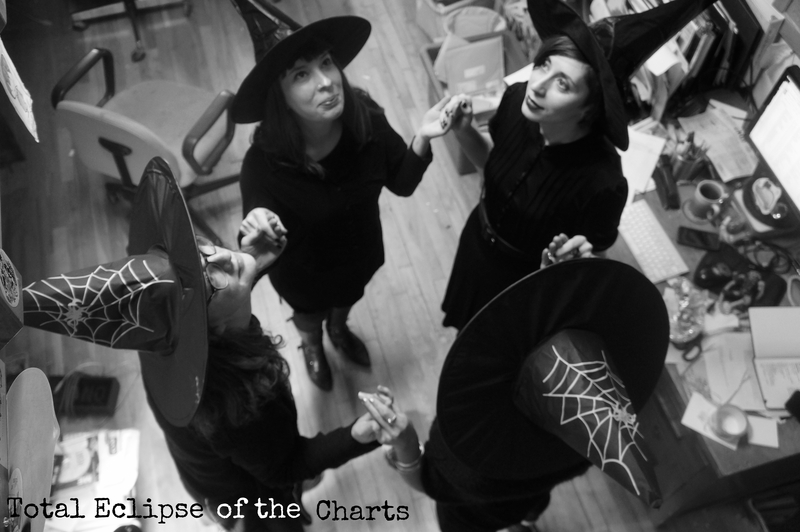 . .
And hey, check out that spooky photo from when some members of the CKUT crew morphed into a coven of witches and overtook the music office, casting good-vibe fundraising spells all over the station. Finally, happy birthday to our pals over at CJLO! Vive la radio indépendante de Montreal. This entry was posted in Charts on November 7, 2013 by admin.